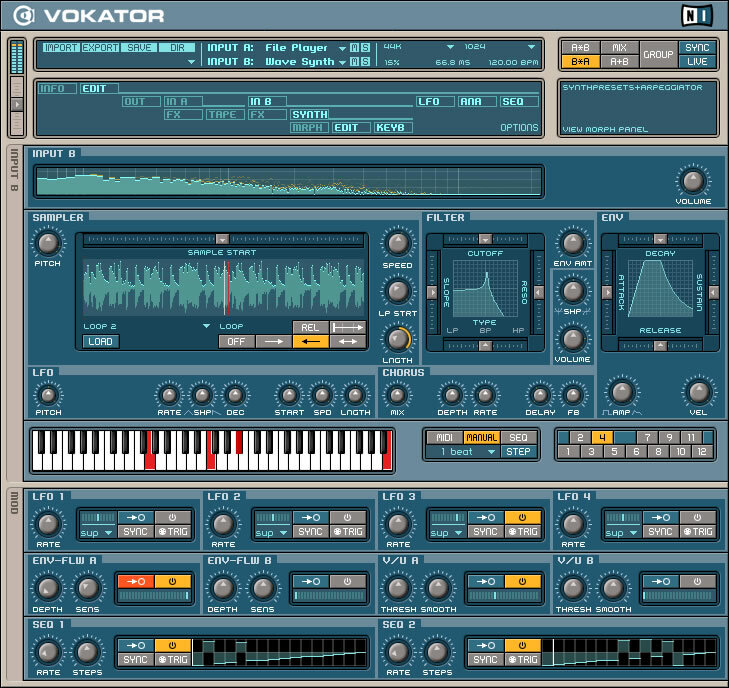 Vokator by Native Instruments is a Virtual Instrument and a Virtual Effect Audio Plugin. It functions as a VST Plugin, an Audio Units Plugin, a DirectX Plugin and an RTAS Plugin. Advanced modulation section includes step sequencers, tempo-synced LFOs, envelope followers, and more. I really love this baby! It’s most striking element? The modulation routings, especially in the Osc Synth. I have never see anything a simple as how one assigns modulation (and amount of modulation) in Vokator. Having 4 LFOs with which one can control parameters like wave symmetry, FM, harmonics, etc is fantastic. Being able to use those same LFOs on almost every other aspect of the Osc Synth is too much fun! In fact, there are so many ways to subvert sounds that I wonder if it will find its way to the mainstream... For someone who likes to tear away at the fabric of sounds, this is a perfect addition to SoundHack, SFX Machine, Pluggo, etc. The only limitation I've found is that you can't modulate an LFO with another LFO. At first, I thought the Osc Synth's choice pf waveforms was meagre, until I realised that you can modulate freely (not discretely) between the four choices, thereby creating a huge number of variations. This synth can create so many timbral colours, it's really a shame that it only offers an ADSR env - why not go breakpoint, like Absynth? Sweeping the harmonics in real-time, I get a sound that reminds me of a PPG. The Wave Synth (WS) is perfect for creating textures. By modulating the Loop Start point with a Random LFO (also affecting pan), and the Loop Length with another LFO, I had the base for a dynamic, flowing texture. One thing that I wish was included in the WS is the bpm of given drum loop. For now, if you have a beat as your WS, and you want to combine it with other loops, you'll have to either use your ears or import the file into ReCycle or your sequencer, and figure it out. That said, Vokator's not a ReCycle-like plug-in, it's just an übervocoder on serious steroids! The audio files that come with Vokator are varied and very useful out of the box (I had no problems calling up new audio files while the plug-in was running). Something else I noticed: if you want to use the WS alone to mangle an audio file, mute the other input (say Input A = Live, Input B = wave synth), or else you'll get an echo effect (Input A/Live is getting a feed from Input B), and you might waste some time making sure the delay and other effects are turned off!